You are here: Home / 1. Warehouse Safety / Rack Safety / How are Rack Safety Solutions Made? We put a lot of care into our warehouse safety products. Your inventory and the safety of your employees depend on them! Our rack safety solutions are made to be the simplest and most effective solution for your warehouse safety needs. We start making our pallet rack netting and safety straps with premium cargo webbing sourced right from the manufacturer. We have long-standing relationships with several webbing manufacturers and suppliers to keep our component costs down. Once our sourced materials arrive, we quality check them. Then we supply the material in bulk to our sewing facility. The facility cuts the webbing to spec for each part number and assembles it based on our technical drawings. Make sure you know how to measure your racks before you order for an accurate fit. After cutting the webbing and elastic pieces, they attach the unique, specially-designed hardware with strong stitching. 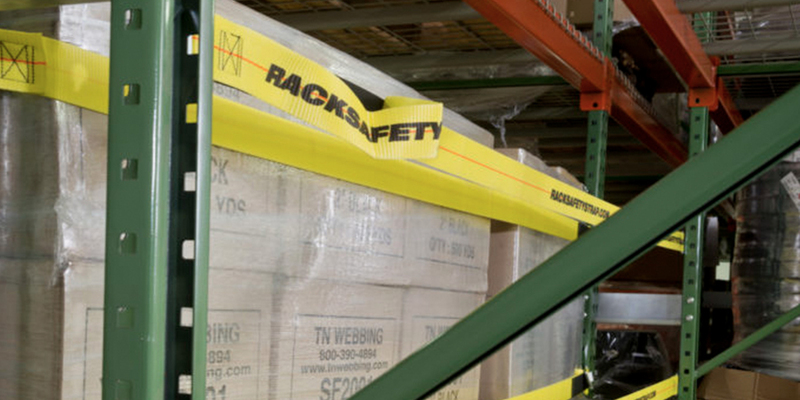 As a result, you have a rack safety solution that attaches to your existing pallet rack in seconds. When we receive finished products from our sewing contractor, we perform careful quality testing once again. We ensure a 99% level of certainty that the finished products meet our standards. We maintain the high-quality materials used in our products by following a Dodge-Romig Sample Table, also known as Lot Acceptance Sampling. This method of statistical quality control determines the sample size required to achieve a determined level of certainty. The model calculates the number of samples needed to test out of a lot to achieve a defined level of certainty. Whether you choose Rack Safety Straps or a sliding or fixed Rack Safety Net, you can be confident that we will stand behind the product’s design and workmanship. Whichever you choose, you’ll have a strong, high-quality safety solution to help keep your warehouse racking or workers safer. If you have more questions about how rack safety solutions are made, please contact us today.